I took a challenge to explain RxJS to developers in a simplistic way. The hardest part of the learning RxJS is “Thinking in Reactively". Think of RxJS as “LoDash” for handling asynchronous events. So, What Exactly, Reactive Programming is? Reactive programming is a programming paradigm for writing code, mainly concerned with asynchronous data streams. Just a different way of building software applications which will "react" to changes that happen instead of the typical way of writing software where we explicitly write code (aka "imperative" programming) to handle those changes. A stream is a sequence of ongoing events ordered in time. It can be anything like user inputs, button clicks or data structures. You can listen to a stream and react to it accordingly. You can use functions to combine, filter or map streams. Stream emit three things during its timeline, a value, an error, and complete signal. We have to catch this asynchronous event and execute functions accordingly. Both promise and observables are built to solve problems around async (to avoid “callback hell”). If you're still confused, don't worry, this normally doesn't make much sense at this point. Let's dive in step by step. An Observable is just a function, with a few special characteristics. It takes in an “observer” (an object with “next”, “error” and “complete” methods on it), and returns cancellation logic. Observables provide support for passing messages between publishers and subscribers in your application. Observables offer significant benefits over other techniques for event handling, asynchronous programming, and handling multiple values. Observables are lazy. It doesn't start producing data untill you subscribe to it. 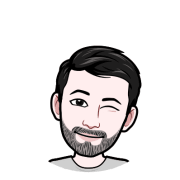 subscribe() returns a subscription, on which a consumer can be call unsubscribe() to cancel the subscription and tear donw the producer. An Observable instance begins publishing values only when someone subscribes to it. You subscribe by calling the subscribe() method of the instance, passing an observer object to receive the notifications. A Subscription has one important method, unsubscribe(), that takes no argument and just disposes of the resource held by the subscription. // was started by calling subscribe with an Observer. An observer is object literal with next(), error() and complete() functions. In the above example, the observer is the object literal we pass into our .subscribe() method. 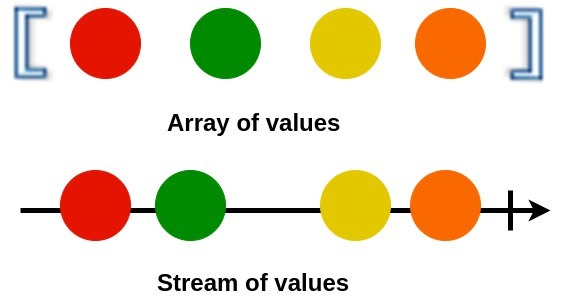 When an Observable produces values, it then informs the observer, by calling .next() method when a new value was successfully captured and .error() when an error occurred. When we subscribe to an Observable, it will keep passing values to an observer until the complete signal. Operators are functions that build on the Observables foundation to enable sophisticated manipulation of collections. An Operator is essentially a pure function which takes one Observable as input and generates another Observable as output. There are operators for different purposes, and they may be categorized as creation, transformation, filtering, combination, multicasting, error handling, utility etc. Operators pass each value from one operator to the next before proceeding to the next value in the set. This is different from array operators (map and filter) which will process the entire array at each step. RxJS provides many operators, but only a handful are used frequently. 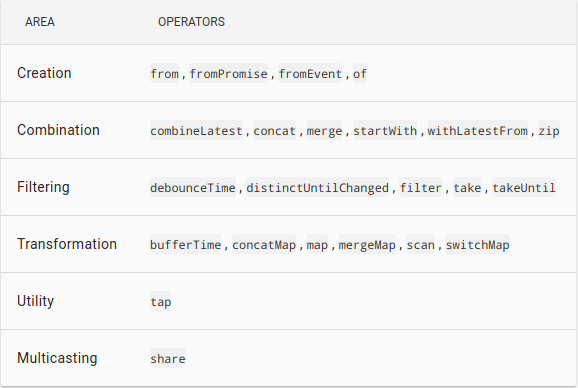 For a list of operators and usage samples, visit the RxJS API Documentation. RxJS Subject is a special type of Observable that allows values to be multicasted to many Observers. While plain Observables are unicast (each subscribed Observer owns an independent execution of the Observable), Subjects are multicast. 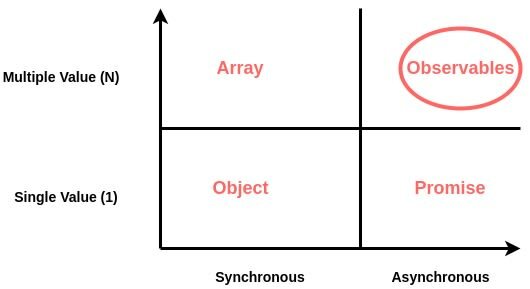 A subject in RxJS is a special hybrid that can act as both an Observable and an Observer at the same time. For better understanding, we're going to compare and contrast the ES6 Promise API to the Observable library RxJS. We will see how similar Promises and Observables are as well as how they differ and why we would want to use Observables over promises in certain situations. If you make a request through the promise and wait for a response. You can be sure that there won’t be multiple responses to the same request. You can create a Promise, which resolves with some value. Promise is always resolved with the first value passed to the resolve function and ignores further calls to it. On the contrary, Observables allow you to resolve multiple values until we call observer.complete() function. Example of Promise and Observable. Promises are eager by design meaning that a promise will start doing whatever task you give it as soon as the promise constructor is invoked. Observables are lazy. Observable constructor gets called only when someone actually subscribes to an Observable means nothing happens until you subscribe to it. // demoObservable not started emmiting values unitll we subscribe to it. One of the first things new promise users often wonder about is how to cancel a promise. ES6 promises do not support cancellation yet. It is, the reality of the matter is cancellation is really an important scenario in client-side programming. Use a third party library like a bluebird or axios they offer promise cancellation feature. Observable support cancellation of asynchronous task by calling unsubscribe() method on Observable. 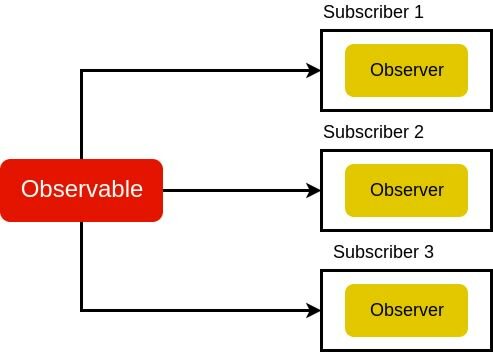 When you subscribe to an Observable, you get back a Subscription, which represents the ongoing execution. Just call unsubscribe() to cancel the execution. Debounce - Wait X time, then give me the last value. Throttle - Give me the first value, then wait X time. bufferTime - Collects values from the past as an array, and emits those arrays periodically in time. Thanks for reading. I hope you like this article feel free to like, comment or share this article with your friends. For more depth understanding of RxJS checkout provided reference links. The combination of theoretical aspects about Observables and practical examples is very relevant. Also worth noting that RxJS is actually just the implementation of the ReactiveX (or Rx) API, which has been implemented in 18 languages. I have not any plan for writing Rx in other language but if developers want then I will write an article on Rx in python. It would be nice to update examples with pipeable operators since Observable monkey patching was removed in RxJS 6. I agreed with you Dmitry, in this post I was trying to introduce Rxjs for beginner developers. Later I will create another post on RxJS operators. Thanks for your feedback. It's still better to teach beginners the correct way from the beginning, I guess. Great article Sagar. Very indepth explanation on Observables. I just don't understand why RxJS hasn't picked up that much with it's advantages. I hope people start using it after reading your article. RxJS is powerful library around us but due to complexity people absolute ignore it. Bigger companies like Netflix, Google used rxjs in their project for handling massive amout of data. We should implement in our next project. Thank of response. I agreed with you @Zilu..
Awesomemic! Thanks for the work! This is the best introduction to Rx that I've found on the net. Keep writing! Awesome post. What tool do you use for the diagrams? Usually I prefer balsamiq but in this article I used draw.io web application.